This particular food combination is so nebulous as to barely qualify for recipe status, but it's SO yummy and incredibly versatile. 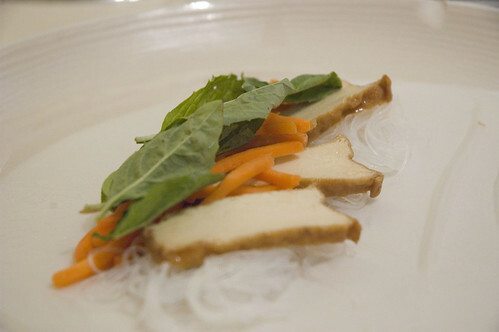 The basic premise is that you take a protein of your choice, some julienned veggies, rice noodles, fresh herbs and bean sprouts and roll it up in rice paper. Then you dip in peanut sauce. I love this. I could probably eat it every week for the rest of my life and not get sick of it. Generally, I make it with shrimp, but in acquiescence to hubs' low-sodium demands, I decided to make this one with tofu (I used teriyaki marinated), but really you could use anything and it would rock. And then try to roll it up (sorry, no pics as this is very much a two-handed task for inexperienced folks such as myself). 1. Combine peanut butter and hot water. Stir until smooth. 2. Add soy sauce, sugar, garlic, chili pepper and coriander. You can top with more chopped peanuts and coriander. 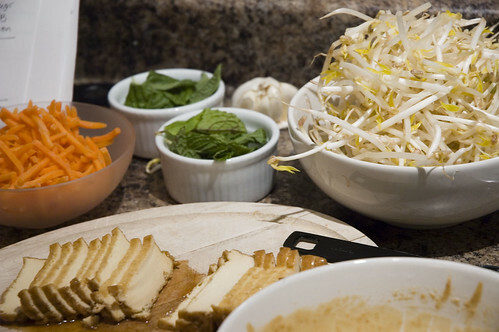 This sauce is also great with satay or on noodle salad. Yum. 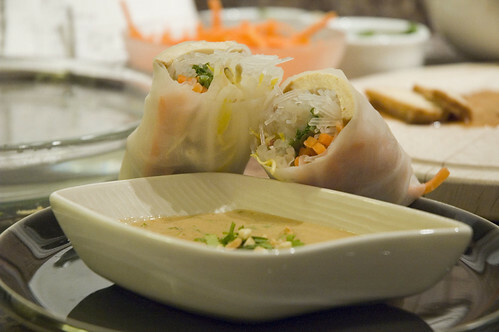 Fabulous spring rolls and peanuts sauce is the best with them. I looooove spring rolls. I like putting mango in mine. I tried out your spring rolls and penaut sauce recipes. They are fantastic! Thank you so much for sharing. I particularly love that peanut sauce; it's the best I've ever had!! I have lots of sauce left over, do you have any suggestions on what I can do with it? I was thinking of some kind of cold pasta? Will definitely try this out! :) Thanks Leslie! Definitely great for hot summer days!